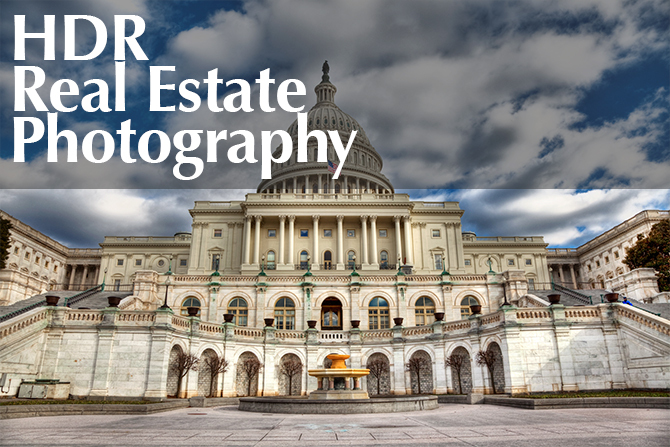 We have already looked at a HDR real estate photography tutorial using the Enfuse method of blending brackets. When I first started my business it was one of two options. The other option for blending multiple exposures together was strict HDR software like Photomatix. At the time, Photomatix didn’t have an Enfuse option so the result was over-saturated, overly tone mapped images. 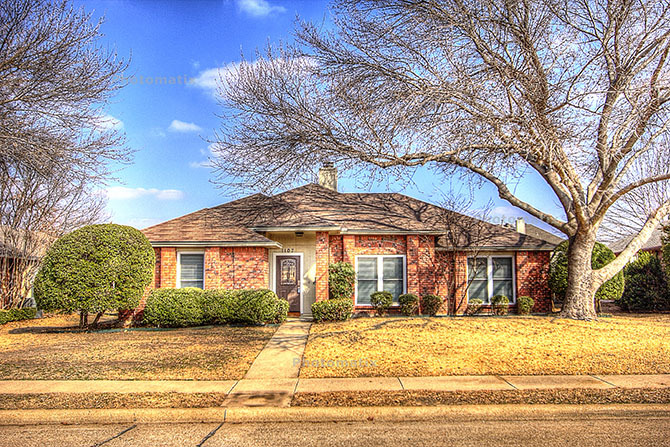 I see different variations of HDR photos online for property listings and thought we could go through a couple and look at their strengths and weaknesses. 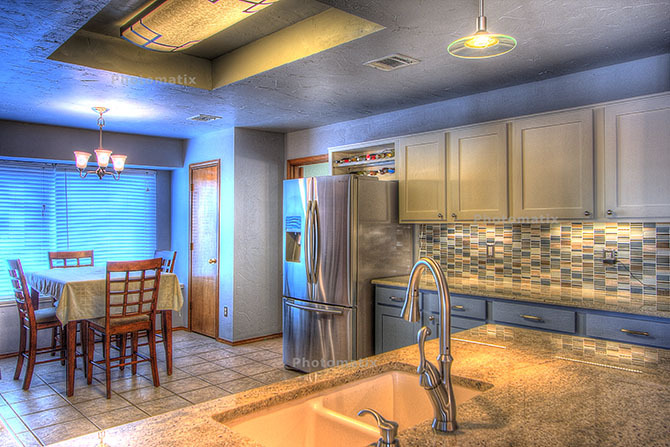 When I first started seeing HDR Real Estate Photography, it was the classic stereotypical HDR. Tone mapped images resulted in over-saturated, cartoon-like photos. Although the result is a bright, artsy photo, it doesn’t give an accurate representation of the property. When buyers go to look at the home in person they’ll be presented with something totally different than what they saw online. The below photos were created in Photomatix. 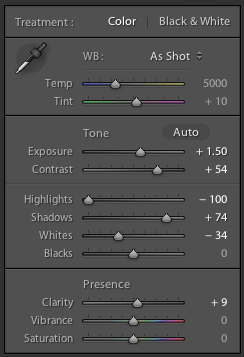 You simply import your bracketed shots and select a tone mapping preset. 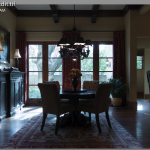 My recommendation if you use Photomatix for HDR real estate photography is to take advantage of the enfuse settings. You can get a much more realistic result compared to the very colorful versions shown below. Knowing I didn’t want to provide the above examples to my clients, I started using Enfuse with Lightroom. You can watch a full-length video and read all about the process in a previous post here. The end result? Photos similar to the below examples. They look natural and more closely resemble the accurate colors of the property. Buyers won’t be misled by looking at inaccurate photos online. To me, these photos appear more pleasing and are easier to look at. 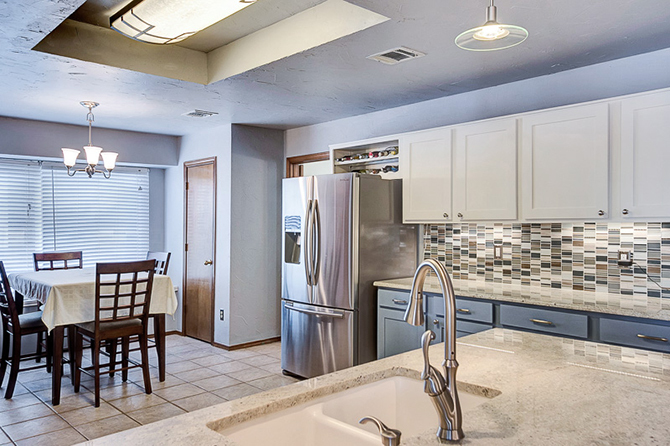 You’ll notice a difference in the kitchen photo especially. In the HDR tone mapped version above, there was a lot of blue and orange present. They were almost competing with each other on each side of the photo. This negative quality disappears in the Enfused version below. I owe a shout out to reader Ron Paulk for sharing the following with me. 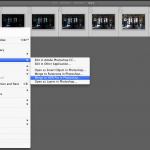 He showed me how you can send bracketed images from Lightroom over into Photoshop. You can then merge them as an HDR within Photoshop. When you bring the HDR image back to Lightroom, it’s a 32-bit file which allows for a lot of editing capabilities. 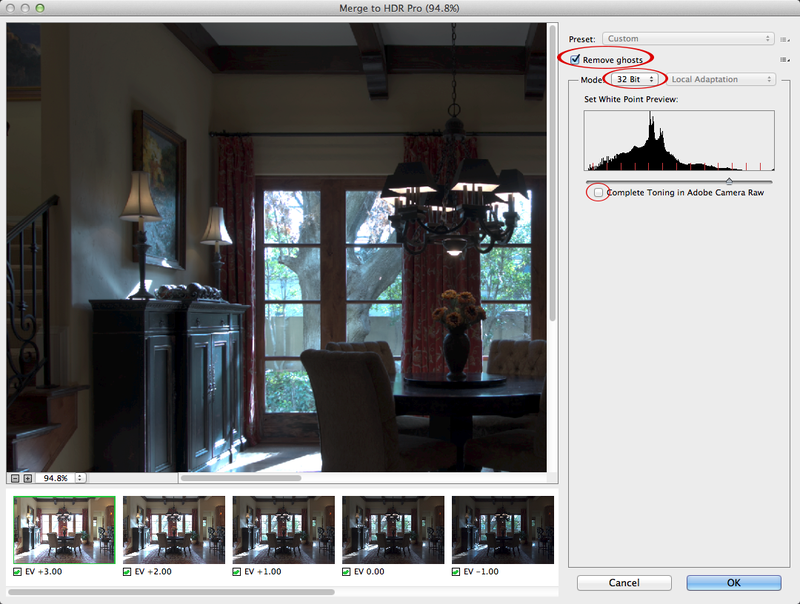 One of the major benefits of this version of creating an HDR image is the ability to save the highlights. You can definitely see in the example that the window view is more visible than in the Enfused version. However with all good things comes a compromise! The process of editing brackets like this takes time. You have to do each bracket individually, which will require you to be at the computer for each blend. Also each set takes about 5 minutes or so to blend. With Enfuse you can blend them all in bulk. And there’s no need to sit at your computer if you don’t have anything else to do. I like how Enfusing frees you up whereas creating the HDRs in photoshop tie you down. I think using a mix of everything could be a great route to go. 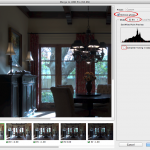 For photos where highlights/window views aren’t an issue, just use the Enfuse method. But for the few shots where you need to try and save a window view, pull them into Photoshop. This way you get a good result when you need it, but only spend the time when necessary. It’s easier to see comparisons between the different types when they are directly on top of each other. Below is a slideshow of the photos above so you can compare the various versions of the editing methods. I really appreciate your blog information sharing. Why don’t you have a paid subscription so that we can share you knowledge and you get support from the fund. Thanks for the kind words Cliff, I’m glad you are fine ding the site useful! Awesome glad you will find a use for it Terry! 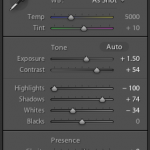 I would love to see HDR via Photoshop compared with the Photomatix + Enfuse. I currently use Photoshop for all my listings but would like to transition into something a bit smoother, simpler and more efficient. I’m currently dissecting all of your articles. Thank you for everything! Glad you are finding some useful information Dan! Well it’s been two months since I found your site and I am off and running! All of your tips for Real Estate Photography have been invaluable. I am using Lightroom + Enfuse plug-in with great success. I did a 30 day trial with Photomatix and found it too time consuming for a group of photos. Your site gave me a HUGE head start with my business. I think I have watched your tutorial on LR+Enfuse at least 20 times! I was new to both programs and found your method very easy to follow. I know there is still room for improvement so I look forward to all of your new posts. Thank you for all of your time and effort that you put into your blog. It is truly a great source of information. Awesome Janet – thanks for sharing! Wishing you all the best! Thanks for the help earlier today. but I prefer your thinking regarding a Catalog for each job. the things I can’t figure out is how to make a new Catalog. Do you do any online “webinar” type instruction? Please contact me directly if you’d like to set a session up. especially the new Catalog thing. Glad you are finding everything helpful Logan! No I do not have any online webinar type instruction sessions. 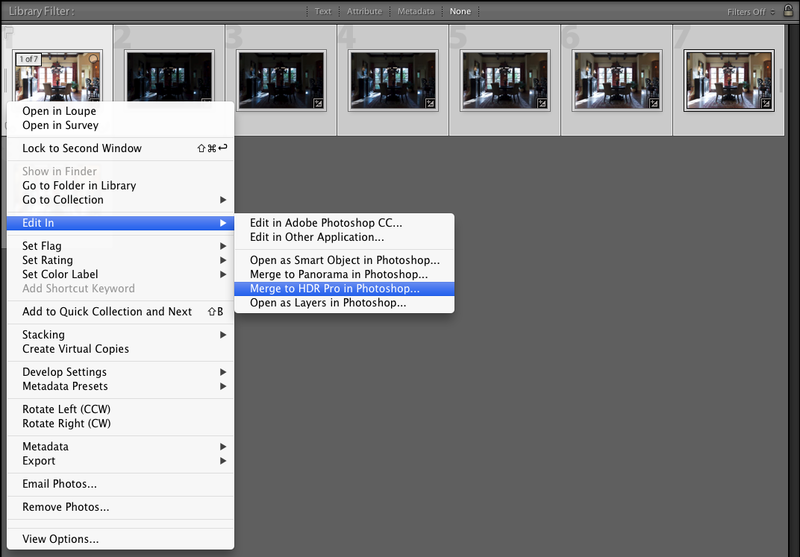 To create a new catalog, open Lightroom and then go to File->New Catalog. You can then name the new catalog based off the property address. This keeps all of your properties separate so you don’t have one massive Lightroom catalog that could end up running slow on your machine. Additionally, it allows you to archive or backup an entire property including the catalog. Or if you would like, you can delete the catalog for a property and it won’t affect any of your other shoots. 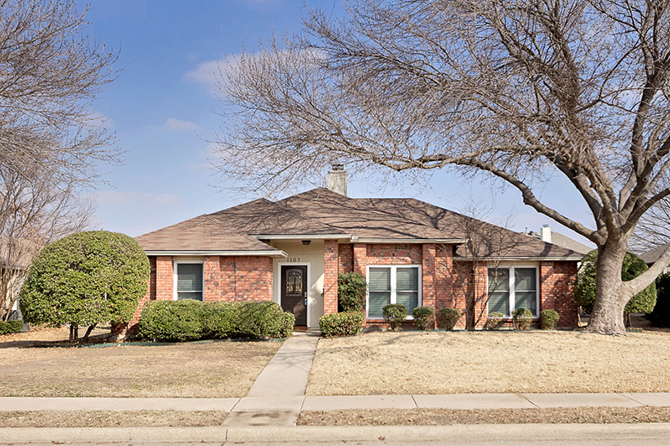 I’m Gianni,i’ve casually discovered your website and I would like just thank you for share your tips and advice and encourage people (like me) who are interested to start a new business in realestate photography. Thanks for the kind words Gianni – much appreciated! However, installing Enfuse on Windows 7 64 bit, is not that straight forward. Could you help me out on this, or direct me to a tutorial on installing Enfuse? I unfortunately don’t know anything about the standalone version of Enfuse – sorry! Adobe does have trials for their products so I would download Lightroom and use it with Enfuse on the trial. When you are comfortable with the end result, you can either sign up for their $10/month service, or pay $100-$150 for Lightroom standalone depending on what the going rate is. Good luck! Thank you for your suggestions. I just learned that EnfuseGUI comes with a bundled version of Enfuse, and installes it automatically. In case anyone else was looking for a stand alone version of Enfuse, you might want to try EnfuseGui out. It’s free too! Hello. I have been trying your technique its exactly what I have been looking for to get that crisp HDR look. But for some reason when I merge my photos this way i do not get that result at all. Any suggestions? When I switch to 32 bit they are so over exposed! Hi Lance, I want to thank you for all of your blog articles, guides, and resources. Your knowledge has really helped me begin my venture into real estate videography/photography. I can’t say it enough, but thank you for all of your time and effort! Thanks for the kind comments Mark, glad you found the site! 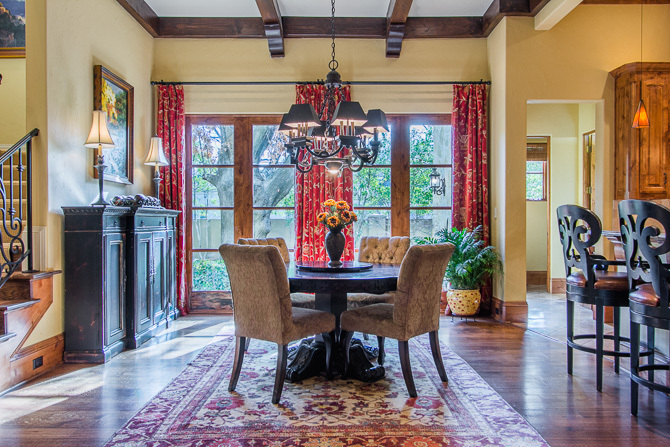 Hello Lance, I want to thank you for your simple yet extremely effective HDR effects as it has enabled me to develop my Real Estate interior photography. people now want to see, more than ever, the blue sky and the view outside of windows… Previously I had either used flash on full power and underexposed my shot to bring out the outdoor view, or done some photoshopping, deep etching windows and underexposing them in layers, then flattening the image for an end result. I must admit, shooting 5 frames at 3 shutter speeds less each time, under and over exposed does a great job. I am perfecting your method by doing a little extra tweaking to maximise the sky view thru windows, and so far so good! general, interiors and exteriors, and evening photos work amazingly well with your method, but a large room with a dull interior combined with a bright light thru thew window is still challenging, even with 5 frames. It’s going well though. I can see I will have to do a little bit more tweaking, but the benefit is I no longer use Flash unless I just need a bit of fill in one corner, otherwise the Flash tends to show imperfections in ceiling paint, reflections in glass, tv screens or artworks. Bathrooms also look great with your HDR tutorial. Thank you so so much, Dave, NSW, Australia. Glad you found the site Dave and that you are getting some use out of the info! No Frank, I don’t think you’ll find that from software. It unfortunately can’t do it all! HDR is great, but multiple flashes and hand blending is probably the best route if you want top quality to go after higher end agents/clients. Thank you for the tutorials. 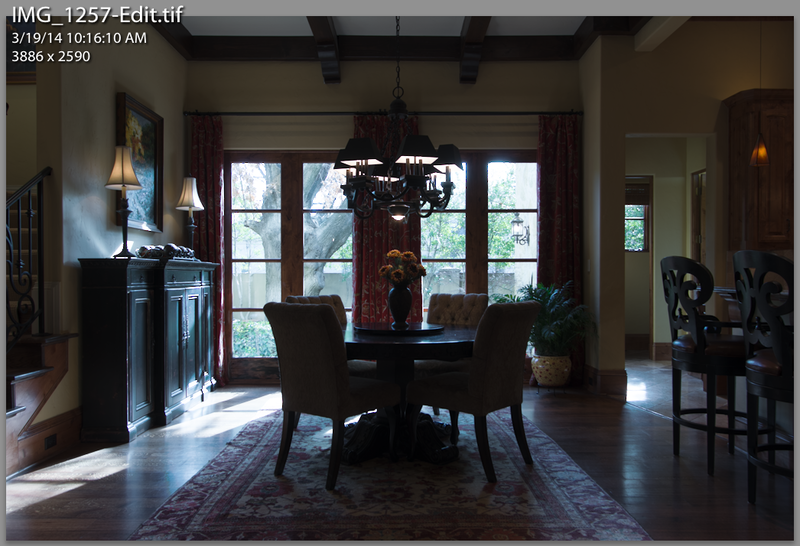 What works for me is to use the Enfuse for interior and the Photomatrix for exterior shots. Do you have any tricks for making the windows look more colorful and natural when using the Enfuse? Glad you found the site and are finding some info useful! It’s hard to get windows to pull through using strict HDR/Enfuse/Photomatix. Some times they come through, some times they don’t. The biggest thing is to make sure your bracketed set is correct, with an even span across the histogram from the darkest exposure to the brightest. But outside of that, you are at the mercy of the software doing the blending, and how bright it is inside the home. If you REALLY need a window view, I would recommend doing a window pull with flash. On YouTube look up Nathan Cool Photo and then search his channel for window. You’ll find a couple examples of window pulls where you can still use your base blending method, and just add a quick/dirty flash frame to pull the window. Where is the best place to buy/download Enfuse?